In medium bowl, mix beef, bread crumbs, 4 1/2 teaspoons of the parsley, the oregano, cinnamon, pepper and garlic until well blended. Add egg whites; mix just until combined. Shape mixture into 12 (1 1/2-inch) meatballs; place on plate. Cover; refrigerate 5 minutes. Heat oven to 375°F. In large ovenproof skillet, heat oil over medium-high heat. Cook meatballs in oil 8 minutes, turning frequently, until browned. Drain well; wipe skillet with paper towels. Return meatballs to skillet. Spoon marinara sauce over meatballs. Bake 12 to 13 minutes or until meatballs are thoroughly cooked and no longer pink in center. Meanwhile, cook and drain spaghetti as directed on package. Sprinkle meatballs with remaining 1 1/2 teaspoons parsley. 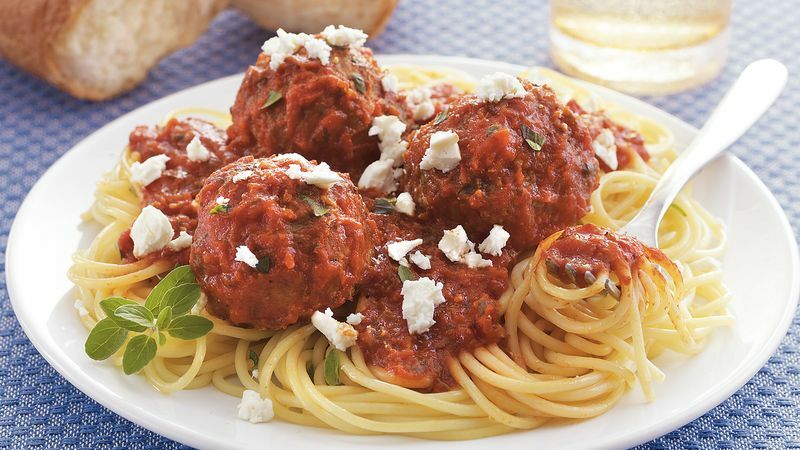 Serve meatballs and sauce over spaghetti; sprinkle with cheese. Garnish with oregano sprigs.